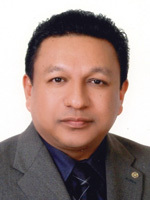 He is also Executive Member of the Canada-Nepal Business Chamber, Federation of Nepalese Chamber of Commerce and Industry and various other chambers of commerce and industry (Nepal-Russia, Nepal-German, Nepal-China, Nepal-Britain, and SAARC-Nepal); and Special Member of the Confederation of Asia-Pacific Chamber of Commerce and Industry. As an Energy and Hydropower Expert, he advised the Economic Advisory Council of then Prime Minister of Nepal Dr Baburam Bhattarai in 2012, and was a member of the Electricity Tariff Fixation Commission. Mr Pradhan received several awards and recognition for his contributions to the field of hydropower and clean energy including Manager of the Year Award from the Management Association of Nepal, HYDRO Nepal Excellence Award in Energy (Hydropower), and Best Entrepreneur Award conferred by the Engineers Association of Nepal.